I actually know the association business. I may not be an expert at it like John Mancini, but I made a point of learning the business while I was AIIM’s Chief Information Officer (CIO). I attended association industry events so I could be more effective in my role. In that time I learned that there were two primary types of associations. There were ones that had members that were companies and those that focused upon professionals. Neither was exclusive to the other as companies are made-up of people and sponsorships from companies help finance professional associations. The difference is where you focus your attention. Whose interests do you serve? Ostensibly, AIIM is focused on the information professional. As the Global Community of Information Professionals, their stated goal is to help the information professional. That means that every program should be viewed through the lens of determining if it helps the information professional. Finances are important and I’ll get to that later. I will state unequivocally that AIIM has a lot of resources to assist anyone new to the space. The training is excellent and will help jump-start anyone starting their career in the space. The webinars offer a variety of topics, though finding a variety of topics to fill every week of the year is a challenge. The research is also interesting though it is typically confined to survey responses from the membership. When talking to AIIM members about what they get for their dues, it often boils down to either discounts or giving back to AIIM out of a sense of obligation or gratitude. Most of the things that they value are available to those that are willing to sacrifice their contact information. The problem is that discounts are not valuable. A sense of obligation only works until budgets get tight and they always get tight. It thrives in spite of AIIM’s efforts. The annual AIIM Conference is excellent. I’ve only missed one iteration of the current incarnation of the conference and it has been well run. The conference is always attended by smart people in the space with whom I enjoy connecting. The problem is the rest of the year. Chapters are not in good shape. Meetings in cities like Washington, DC should not have less than 20 attendees. AIIM HQ has failed to help chapters in Phoenix and across the country. While there are two sides to every story, the stories about poor support for chapters is too consistent to be ignored or written off as exceptions. Having seen the other side of the operation, I can attest that chapters, at least a couple years ago, were a low priority item within AIIM HQ. And there is no evidence that things have changed since then. I have a few ideas on this front. I’m not active in chapter leadership so my suggestions are just a starting point. Not all are easy to implement but the goal of this list isn’t to be right or wrong. The goal is to get people thinking about what could be done. Turn the spring/fall seminars into chapter events. Let the chapter officially host the event. Let sponsors attend and speak but let the speaker list be at least 50% drawn from the local community. Throw in an AIIM HQ speaker and lend support for the marketing, the event turns into an educational event that also serves as a recruiting tool for the chapter. Every chapter should have a visit from AIIM HQ every program year. There needs to be an annual meeting of chapter representatives with up to two attendees per chapter. It needs to be attended by AIIM leadership. That means the President and the Board of Directors chair. The head of marketing should also attend. Put someone from the chapters back on the AIIM Board of Directors. Ideally two people, allowing for more reliable attendance at board meetings and more diverse representation. These people should be voted upon by the chapters at the annual meeting. Pass a rule that every third chair of the board should be a chapter representative. This would mean that at any given time, either the vice chair, chair, or immediate past chair would be a chapter representative. End-user representation is nice but if they are not active in their local chapter, their leadership value to the board is diminished. Add something for chapters at the AIIM Conference. A mixer where anyone can attend and learn about the chapter nearest them. Sometime on day two would be ideal as it would give people time to get situated in the conference before attending. Talk to the chapters. See what they want. See what they need. Execute and prioritize their requests with their input. There needs to be clear communications from chapters to HQ. The chapters need to not only be heard. They need to be respected, valued, and listened to by AIIM leadership. When building an association, or any organization, engaged people are more loyal and are more willing to pay. Having engaged local communities throughout the country, and the world, is the best way to build an excited community. AIIM has been trying to build a “global” community without focusing on all the local communities that are the foundation for larger community. Remember SoLoMo? It stood for Social, Local, and Mobile. It was an approach to engaging people in the new mobile world. AIIM, like many organizations, lost sight of Local and it has cost them. It’s like trying to build a log cabin with rotting logs. You’ll constantly be wondering why it isn’t stable and providing the benefits that should core properties of a cabin. Another reason is very practical. More members on the rolls of the chapters means more members in AIIM proper. If member retention can be increased beyond what was it was sitting at when I was there, then numbers can start to grow. The numbers have been stagnant and AIIM has had to keep recruiting new members to replace the ones that just stop renewing. The reason for this comes back to economics. While AIIM makes some money from professional memberships, that number is likely under $1 million. Even if it is doubled, that isn’t going to finance AIIM. Every other program needs to bring in revenue. Those programs make money with names. Companies sponsor webinars, research, seminars, and the conference. They pay for it all from their marketing budget. They get brand exposure, recognition that they are trying to help the industry, and the names of the people that participate in the program. More names = more leads to hand over to sponsors = more money that AIIM can charge for sponsorships = more money that AIIM can use to support their professional members. Makes financial sense to me. The suggestions are either overall suggestions for changes or are benefits to Professional Members. Commit to Digital: The fact that they ask me for a physical address or a phone number when I register for something is wrong. We are in a digital world. I don’t want things mailed to me anymore. I let it slide on conference registrations sometimes but for everything else, no. Just stop it. Country and postal code make complete sense because it allows for local, targeted marketing efforts but you don’t need to know my street address. If the vendors insist on having this information then they are wasting their marketing spend. Fix the Data: I know this is not easy but it impacts the perception of AIIM. While implementing different systems for different functions (sales, marketing, learning, community, etc.) is a way to quickly gain more capabilities, when the data is disconnected there is a problem. I see and hear about this as people have to repeatedly provide the same information or mark email as spam to stop receiving unwanted emails. This level of expectations may not be fair but when you service the information industry, members notice when your information is not in shape. Provide more Research Data: Research would be much more interesting if professional members had access to the raw data. Pull out the personal information but knowing the demographics, correlating answers, and even knowing if there was a different response between professional members, associate members, and non-members would be interesting. It would be an easy add-on for professional membership that would definitely be worth pulling together. It would also allow for correlations between different research reports for the industrious data analyst. This would be inexpensive and provide great value. Transcribe Webinars: Webinar transcripts would be useful. Being able to scan a transcript for information and quotes would be valuable for busy professional members. Having select transcripts for some webinars (e.g. discussing AIIM research) available to the public would also help with search engine optimization (SEO). SEO drives web traffic which would benefit AIIM directly. Open up the ELC: The Executive Leadership Council (ELC) is currently a vendor focused event that comes out with some interesting thought pieces. The question is, how does it serve the professional membership? I am not saying the ELC doesn’t but the benefits need to be clear. Right now, only vendors can participate though anyone can get the reports. Perhaps if professional members could view recordings of the talks that were given that would be an improvement. Maybe a way for some professional members to attend? Selection could be done by the chapters. A live stream or the ELC for professional members would also be valuable even if the attendee list didn’t change. Better online community: What does this look like? 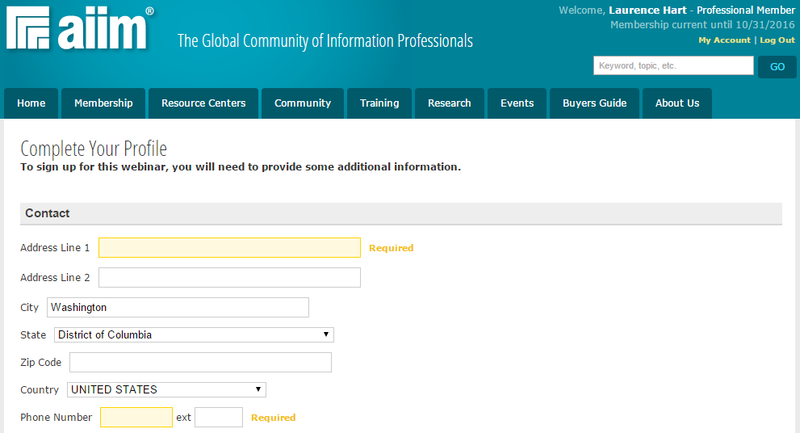 A dedicated community resource from AIIM is a good start. The online community was a lot stronger when AIIM had one in place. A well-implemented community product would be the second need. To be honest, I’d start with the chapters and ask them what they need. A blogging platform is nice but it needs to have some curation. The expert blog posts from the old days were useful but they are gone now. Mentoring Programs. You can find this in the community site but it is hidden and limited. Designing the program and making it a larger benefit would be useful. Perhaps allow mentors a free professional membership if they are highly rated by five or more people they mentored and are still actively mentoring people. That’s just the easy things that I have thought of over the years or heard suggested by others. Many ideas have been discussed so much it is hard to remember from whom they originated. In the end it doesn’t matter as ideas are needed to stimulate action in the AIIM leadership. If you made it this far, thank you. You obviously care about the industry and want a better association. Share the ideas above that you think have value. Add more ideas in the comments. Send your thoughts about any ideas that you think have merit to AIIM. Use twitter, blogs, email, or all of the above. Anyone can write something on LinkedIn. Share the link here if you don’t have twitter, or even if you do have twitter. Let me know and I’ll help amplify your efforts. It will take a lot of us working together in order to spur action. As John Mancini pointed out, let’s keep it civil. The goal is to build a stronger AIIM and not to tear AIIM down. People can have bad ideas or make mistakes but that doesn’t make them bad people. I know the AIIM staff personally and they all care and work hard. Don’t be afraid if your idea isn’t perfect or could not work. I’d rather see bad ideas be suggested than none. As long as debate and discussion ensues from the idea, it is a success. “Ostensibly?” I say nay, nay. As far as “what do I think,” the pragmatist and realist in me says despite your suggestions, which are good and not unreasonable, they will fall on deaf ears and a tipping point of no return has already, previously been passed. Again, not a pessimist and really no interest in tearing down this association, just… apathy at this juncture. But hey, good luck with that. Long, but thoughtful post here. Interesting ideas. Thanks for including ref to my post Laurence. I firmly believe that change is needed and listening to members helps with this. I don’t, however, think that it’s just about AIIM or ARMA or even the new groups although the latter have shaken things up, it’s about our profession and where it’s going and what that means regarding support from all the associations. The current associations need to understand and provide support for this change and lead us forward. To do this is brave and bold and may mean joining forces with other groups to succeed. And groups not necessarily familiar to us now. I will stop here or else I will write a longer comment than the post. Thanks for reading. If AIIM wishes to continue as an association dedicated to Information Professionals then it’s No 1 priority is fulfilling the needs of those information Professionals. Chapters are just part of that solution, so are vendors! AIIM should model the path of an “Information Professional” from beginner through to seasoned professional like myself. What are the needs at each stage of their career. Define the what, who, when, how, why. Opportunities to be part of a local Community (or chapters – where has this name come from?) will form part of these needs. The solution should in inclusive from ECM for beginners through to opportunities to increase ones profile / gain long serving recognition as is standard for other Professional Associations. At this time AIIM is a Trade Group. I agree. AIIM’s programs are great getting you started in the field. After that there is less value. The local community aspect is valuable. Another piece of value is more media outreach. Raising awareness of the profession outside those that already know. The world is driven by information yet nobody knows what Information Management is outside of our industry. Not saying this is easy or has not been tried. It is more about a source of value. After reading Pie’s and the words of others, I realized I should be asking myself, “Is it time to step up?” I did just that this morning. I reached out to my local AIIM chapter to pledge my support for the next meeting. I felt I could either stand on the sidelines or get involved and support the industry that I’ve chosen for my career. A lot of people move to broader information scopes because it is rare to just work with content. It is really how we use information to solve problems that I think defines our profession. Content has certain wrinkles to it but I think it still falls into the same scope. Kudos to volunteering. They key is to look for new ideas to solving this. Look at other communities that are thriving as see what they are doing. They are out there. I disagree that it is rare to just work with content. The profession is definitely niche but rich in dedicated long service. Just consider the number of Record Managers and related professionals out there who have done nothing else. I feel you only come to this conclusion when you see it from a IT / technology project perspective. When recruiting for Records Management project teams the contract and professional services industry is littered with individuals who “happened to end up on a” content related project. But have very little knowledge (nor interest) in the profession, moving onto the next project whether it be SAP or a new database i.e. not a content project. Nor are these people interested in becoming AIIM Members. The amount of times i have spoken with these people who have not realised the relationship of their content projects with records management, ” it was managing documents, records are different” is often cited. For me AIIM is not an IT Association, even though obviously IT is used as an enabler to better manage content (sometimes!) but not always. It is supposed to be dedicated to those Information Professionals working in content only or as I put it “for new age Record Managers”. AIIM’s focus should be all things content and the integration of content systems with other non content business systems (data systems). AND management of physical content (paper and other stuff). And increasingly the move to manage data in business systems as records but only from a records management perspective. A high level understanding of the infrastructure required to enable content systems to work e.g. storage, performance etc should be included but only to the level of understanding the enablers to a good content system.